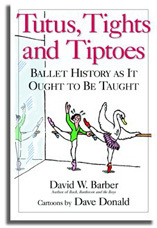 In Tutus, Tights and Tiptoes, classical music historian and humorist David W. Barber casts a wicked, witty and insightful eye at the history of ballet from its beginnings in the French court to its later heights in such classics as Tchaikovsky’s Nutcracker and Swan Lake and more recent scandals such as the premiere of Stravinsky’s Rite of Spring, which shocked audiences and caused a riot in the seats. He also touches on other forms, from Morris dancing to modern jazz. And of country-and-western line dancing – well, the less said the better. Once again, illustrator Dave Donald has provided numerous funny and delightful cartoon drawings, perfectly in step with the text.